Try as I might to plan my work outfits ahead of time and have everything laid out the night before, I more often than not fail miserably. Mostly because I just never know how I'm going to want to dress on any given day. A girly skirt may have sounded great less than 8 hours earlier, but is suddenly a completely ridiculous idea when I'm about 20 minutes from walking out the door and can't find a pair of tights sans run. Then there are the times when I end up standing in my closet in my underwear (hey, at least that's usually an easy choice) without any indication as to what I feel like clothing myself in. Fortunately, we all have those pieces in our closet that we reach for in these situations and my red pants are it for me. With these, I never have to worry if I look pulled together or whether I'll be comfortable at my desk all day. Toss on a basic white blouse and a fun jacket and BAM! -- you're set. And because they're red, I immediately look like I tried harder than I actually did. At least that's how it is here in D.C. because colored pants are like seeing a unicorn for most 9-5ers. What are the go-to pieces in your closet? I know EXACTLY how you feel! It's so hard to pick out what to wear to work in the morning. Some days I think I'm going to try really hard and look super cute and other days I feel about as big as a cow and want to sink into a hole.. haha! 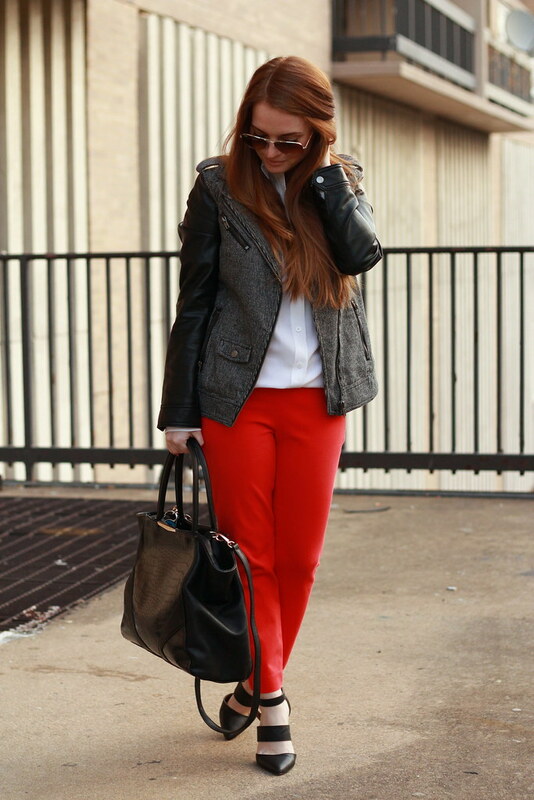 I love my red pants... any colored Minnie or Café Capri are my go-to!! Love this look and your feature on Refinery29!! Love that jacket!! You hair is gorgeous, as always! I try to have two outfits picked out every morning - one for nice weather and one for crappy weather. Even with the best of intentions I find myself in the same spot, staring into my closet every more just wondering what to wear! SO true with the red pants in DC thing. I almost pulled mine out this morning and ended up in tights and a skirt. I can never plan my outfits ahead of time. I NEVER want what I picked out. Ugh the standing in my closet in my underwear completely bewildered is something that happens to me ALL of the time! This is a great go to look. 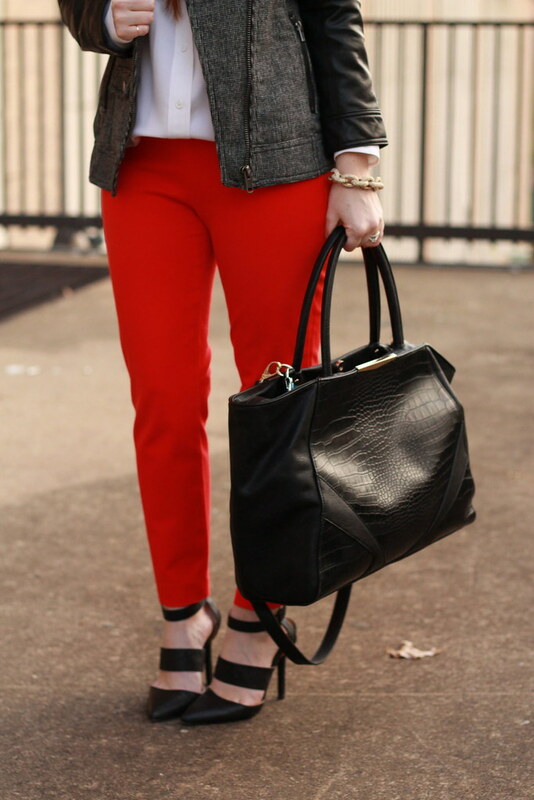 Love the red pants. And that jacket is fab! 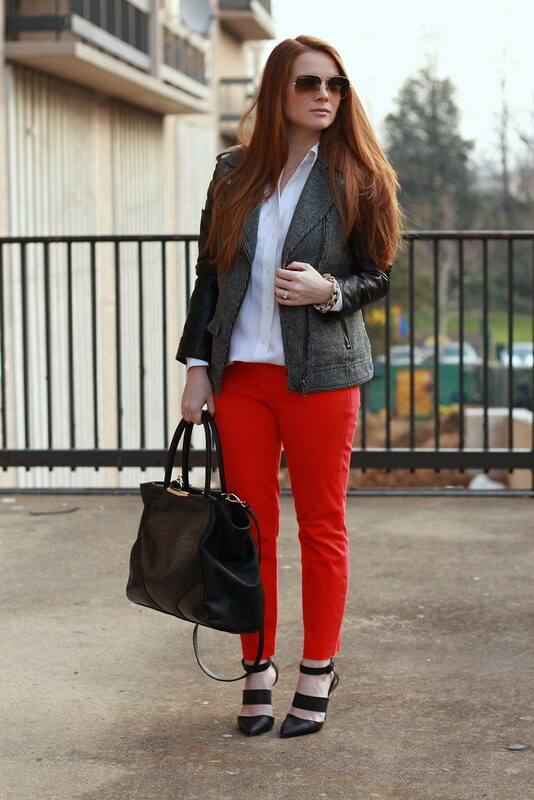 in my line of work all i wear is colored pants so i love this look!